Upon Trojan Field, At Dawn – This heart-stopping poem by Ismail Butera communicates like a warrior bard on a treasure hunt while sifting through the remains of battle-bloodied corpses. “On the Earth as it is in the Cosmos” – a line that will give you goosebumps – is only one of the many evocative lines that will catch your breath in your throat as you float in the dawning air above the littered battlefield of Troy. Ismail Butera, a “teller of ancient epic and spiritual tales,” is also an entertainer and musician of celestial and ancient world sounds. Butera and Natalie Perlaza form the band, “Echoes of Antiquity,” in which Ismail plays such cool instruments as the accordion and long-necked lutes of Turkish, Albanian, and Ukbek origin, while Natalie plays drums, dumbek, and other Persian and Egyptian percussion instruments. In addition to this beautiful and fascinating music, Ismail and Natalie also perform poetic recitations accompanied by costumed actors and actresses who interpret the visions through dance and bring the narrations to life. Pyrrhus and the Golden Table of Zeus, as well as the Odes of Pindar, are included among the wonderful recordings offered on their website. Coming across Ismail’s poem, Upon Trojan Field, At Dawn on his Facebook page, I feel like I have found a long-lost brother. I feel we have much in common, including our love of ancient epics, diverse spiritual nourishment, and haunting world music. As Ismail says on his website, “humans long to remember that which has made us what we are today, and that which informs and guides us as we go forth into the world of tomorrow. These tales reveal our true, inner history, the very building blocks and foundations of our society. ” I couldn’t agree more! A warm and accepting new friend, Ismail has graciously given me permission to repost his poem here. It is both my pleasure and a great honor to share his excellent poetry, music, and spiritual insights with you all. Enjoy! Attic Black-figure Amphora attributed to the Tyrrhenian Group, ca. 560-550 BCE. Source: copyright Yale University Art Gallery via Dartmouth.edu. While vultures circle above…the scurrying rabbit is safe today! What is it to live and die with none to chant thy song? Bogging down before the arrival of Winter? But who would it be to survive and achieve that victory? Since this great war began? How many brave heroes have themselves been broken? Contributing their deeds to inspire the verses of bards? This is absolutely breath taking Kathleen. Thank you for sharing this wonderful poetry. Thanks, Rita – I thought you’d like it! Enter your email address to follow The Shield of Achilles and receive notifications of new posts by email. Guest Post by Armand D’Angour: Was the Real Socrates More Worldly & Amorous Than We Knew? 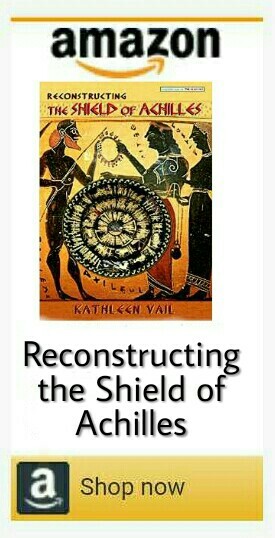 My Book, Reconstructing the Shield of Achilles, is Now Published! Thetis Delivered Achilles’ Shield to…Lord Nelson at Trafalgar? Copyright © 2018 Kathleen Vail. All images of Vail’s reconstruction of the Shield of Achilles are under copyright, with all rights reserved. Please DO NOT PIN images of Vail’s reconstruction of the Shield of Achilles on PINTEREST, or other similar sites! Without express written permission, any redistribution or reproduction of part or all of the contents of this website in any form is prohibited, EXCEPT for images clearly linked and captioned “Source: Wikimedia Commons.” Sharing Wikimedia Commons content must follow the associated Creative Commons License regarding correct attribution. Without express written permission, it is illegal to distribute or commercially exploit this website’s copyrighted content. Nor may you transmit it or store it in any other website or other form of electronic retrieval system. Disclosure Notice: Throughout this website, the Amazon.com links to my book, Reconstructing the Shield of Achilles, are affiliate links. Ancient Greek Red-Figure Pelike ca. 470 BCE depicting Thetis consoling Achilles over the death of Patroklos. To the side can be seen Thetis’ sister Nereids waiting to present Achilles with his new armor. Detail from the “Chigi Vase,” a ProtoCorinthian Olpe ca. 650-640 BC by the Chigi Painter depicting a youth playing an aulos. Known as the “Mask of Agamemnon,” this exquisite funerary mask is made of gold, ca. 16th century BCE. It was found in 1876 by Heinrich Schliemann in Tomb V at Mycenae, Greece. Currently on display in the National Archaeological Museum, Athens, Greece. Attic Black-Figure Column Krater, ca. second half of 6th century BCE depicting Odysseus escaping Polyphemos the Cyclops by tying himself to the belly of a ram. Detail from the Amphiaraos Krater ca. 570 BCE depicting women beside a columned porch waving goodbye to Amphiaraos. Attic Black-Figure calyx krater depicting Greek warriors battling over a corpse, probably that of Patroklos. Painted in the manner of Exekias, ca. 530 BCE. Detail View of Achilles on a Lucanian Red-Figure Bell-Krater, ca. 5th century BCE depicting the battle of Achilles and Penthesileia. Attic red-figure Kylix ca. 490-480 BCE by the Foundry Painter depicting Hephaistos giving Achilles’ new armor to Thetis. Detail from the ancient Greek Black-Figure “Sophilos Dinos” (wine-bowl), ca. 580-570 BCE depicting the arrival of guests to the wedding of Thetis and Peleus, the future parents of Achilles. The first chariot in the procession is carrying Zeus and Hera, and the second is carrying Poseidon and Amphitrite. Attic Black-Figure Oinochoe by the Taleides Painter ca. 520 BCE, depicting Odysseus and Aias (Ajax) quarreling over Achilles’ armor. Black-Figure terracotta vessel (date and artist unknown) depicting an ancient greek ship similar to the type described by Homer in the Iliad and the Odyssey. At the bow of the ship, note the prominently displayed ‘apotropaic ophthalmos’ or eye, and the ‘long-beaked’ ramming nose painted as a wild boar. Attic Black-Figure Band Cup, ca. 560-550 BCE depicting a plowman behind a team of cattle. Marble bust of Homer, ca. 2nd – 1st century BCE Roman copy from a now-lost Greek original. Chalcidian Black-Figure Neck Amphora ca. 540 BCE by the Inscription Painter (Chalcidian) depicting Odysseus slaying Diomedes. Also, please note the tree in the background as an interesting artistic motif. Attic Black-figure amphora ca. 570 BCE Depicting enemy warriors engaging in battle. Late Bronze Age Mycenaean Bronze dagger, bronze with inlaid silver and gold depicting warriors hunting lions, ca. 16th century BCE. Attic Black-Figure Amphora ca. 510 BCE, depicting Aias carrying the mortally wounded Achilles out of the battlefield. Corinthian Painted Wooden Plate, ca. 540-530 BCE depicting a procession to an altar to sacrifice a lamb, accompanied by flute and lyre. The names of the Three Graces are inscribed on the plaque, which was found in a cave above the village of Pitsa, in Corinth, Greece. Nikosthenic Black-Figure Amphora, ca. 530 BCE depicting a king and his ambassadors. Attic Black-Figure Exaleiptron (tripod), ca. 570–560 BCE by the C Painter depicting the moment when Athena springs fully grown from the head of Zeus. Hephaistos, on the left, is identifiable by his double-edged axe. On the right, Poseidon is identifiable by his trident. Image of Achilles’ shield from The Iliad (translated by Pope), pg 171 of Vol. 5, published in 1720. Detail of the Mykonos Pith Amphora, ca. mid 7th century BCE, showing what is thought to be the earliest depiction of the Trojan Horse. Attic Black-figure Amphora ca. 585 BCE by unidentified painter depicting two warriors in battle, possibly Achilles and Hektor, with the mother of each, Thetis and Hecuba in this case, to left and right of the warriors. Attic Red-Figure Kantharos, c 450-400 BCE by the Eretria Painter depicting Achilles and the Nereid Kymothea. Attic Black-Figure Neck Amphora, ca. 510 BCE, depicting a man playing a lyre for women. Corinthian Column-Krater, known as the “Eurytios Krater” ca. 600 BCE depicting men preparing the hind legs of a sheep in preparation of a feast. Detail view of an Attic Red-Figure Amphora ca. 440 BCE depicting Athena facilitating the meeting between Odysseus and King Alkinoos’ daughter Nausicaa after Odysseus washes up naked onto the island of Skheria. Receiving aid from Athena, Odysseus has gathered a few branches in a pitiful attempt to hide his nakedness from the women. Minoan-era Terracotta Pithos, ca. 1800-1700 BCE depicting ocean wave patterns and fish caught in a net. Detail from an Attic Black-Figure Stamnos ca. 500 BCE, depicting revelers dancing behind a man playing a lyre. Attic Red-Figure Amphora ca. 440 BCE depicting Athena facilitating the meeting between Odysseus and King Alkinoos’ daughter Nausicaa after Odysseus washes up naked onto the island of Skheria. Receiving aid from Athena, Odysseus has gathered a few branches in a pitiful attempt to hide his nakedness from the women. Chryses attempting to ransom his daughter Chryseis from Agamemnon. Side A of an Apulian red-figure volute-crater, ca. 360 BC350 BC,by the Painter of Athens 1714. Found in Taranto, now in the Louvre. Attic Black-Figure Amphora, ca. 550 BC. by the Amasis Painter depicting the Recovery of Helen by Menelaus. Detail of Attic Black-Figure Column Krater, ca. 525 BCE depicting a lion attacking a bull. Early Cycladic II era clay “frying-pan” ca. 2700-2500 BCE depicting the sun surrounded by ocean waves and fish. Detail of the ancient Greek Black-Figure “Sophilos Dinos” (wine-bowl), ca. 580-570 BCE depicting guests attending the wedding of Thetis and Peleus, future parents of Achilles. Athena and Artemis are seen riding in the chariot, followed by Thetis’ grandfather, the fish-tailed sea-god Okeanos, his wife Tethys, and Eileithyia, goddess of childbirth. Hephaistos brings up the rear, seated side-saddle on a mule. The Lion Gate at Mycenae, Greece – portal to the Ancient Greek royal seat of Agamemnon, leader of the Greek forces in the Trojan War made famous in Homer’s Iliad and Odyssey. Greek Black-Figure amphora, ca. 540–530 BCE depicting Hermes and Io (in the form of a cow). Attic red-figure pelike, ca. 470 BCE depicting a shepherd riding on the back of a ram while playing the aulos, or double flute. Attic Red-Figure Kylix (interior) ca. 480 BCE by the Briseis Painter depicting King Priam entering Achilles’ hut to ransom his dead son Hektor’s body. Tondo of an Attic Red-Figure Kylix, ca. 500 BCE, depicting Achilles tending Patroklos’ arm, wounded by an arrow. Attic Black-Figure Kylix, ca. 560 BCE by the C Painter depicting nereids dancing in a line. Detail of an Attic Black-figure Hydria, ca. 575-550 BCE, depicting Thetis delivering the new armor to Achilles. Geometric Terracotta “Hirschfeld” Krater, ca. 750-735 BCE, Depicting a Funeral and Funeral Games. A watercolor rendering of drawing of the “Queen’s Megaron” by Emile Gilliéron the younger, ca. 1922-1926, based on Sir Arthur Evans papers relating to his excavations at Knossos in Crete. White-Ground Lekythos ca. 490-480 BCE by the Athena Painter depicting Odysseus’ men turned into pigs by Circe. Attic Black-figure Amphora ca. 490-480 BCE by the Kleophrades Painter depicting the 4-horse chariot racing competition. Typically filled with olive oil, this type of trophy was awarded to chariot race winners at the Panathenaic Games in Athens. The US Supreme Court in Washington, DC features a scene from the shield of Achilles on its massive front door. © Kathleen Vail, all rights reserved. Illustration by Dugald Sutherland MacColl (British draftsman, 1859-1948) of a tondo from an Attic Black-Figure Kylix (ca. 550 BCE) discovered at Corneto. Published in Harrison, Jane Ellen and D.S. MacColl’s “Greek vase paintings; a selection of examples, with preface, introduction and descriptions.” London: T.F. Unwin, 1894. The image depicts maidens holding hands and dancing in a circle. In the center is depicted Herakles wrestling with Nereus, the Old Man of the Sea. Attic black-figure white-ground lekythos, ca. 480 BCE by the Athena Painter depicting Achilles hiding in order to ambush Polyxena as she comes to the public water fountain. Attic Black-Figure Hydria, ca. 510-500 BCE depicting women filling jugs at the public water fountain. Attic red-figure cup by the Brygos Potter and the Brygos Painter, ca. 490 BCE, depicting Briseis, Achilles’ beloved war captive, serving Phoenix, Achilles’ lifelong mentor. Vail’s digitally edited version of an 1887 B&W drawing of an early black-figure painting of the Trojan War on a small Corinthian black-figure Aryballos. From Jahrbuchdeskaiserlich, page 431. Attic Black-Figure Amphora ca. 530 BCE attributed to the painter Exekias, depicting the suicide of Telamonian Aias (Ajax) after Odysseus wins Achilles’ glorious armor in a competition with Aias. Nereus (The Old Man of the Sea), and Heracles depicted at the top of a black-figured lekythos, ca. 590-580 BCE by Istanbul Painter, now in the Louvre. Mycenaean Rhyton in the shape of a bull’s head, ca. 16th century BCE crafted of bronze, inlaid with semi-precious stones, and gilded. Detail view of an Attic Black-Figure Kylix, ca. 510 BCE, depicting satyrs and maenads gathering grapes into baskets. Minoan-era Carved Stone Rhyton, ca. 1500-1450 BCE depicting a grain harvest festival. Vail’s colorized rendition of a B&W drawing of a lost Chalcidian Black-Figure Amphora from 540-530 BCE by the Inscriptions Painter depicting the epic death of Achilles. Note the arrow in Achilles’ ankle. Above Achilles stands Aias fighting off Paris with his bow still drawn. Detail from the Amphiaraos Krater ca. 570 BCE depicting horses and a woman beside a columned portico. Apulian Red-Figured Volute-Krater ca. 410–400 BCE by the Sisyphus Painter depicting the arrival of a young warrior or hero. Alternatively, it could be a departure. It is considered to be possibly Theseus arriving at Athens and being recognized because of his sword by Aegeus. I would also submit its likelihood as either the arrival of Telemachus or Paris to the home of Menelaus and Helen. If you enlarge the image and note the eye contact between the beautiful woman and the handsome young man, you’ll likely agree that it’s Paris before he kidnaps Helen to Troy! Attic red-figured kylix ca. 490 BCE by the Douris Painter, depicting the struggle of Peleus to subjugate the sea nymph Thetis prior to their marriage. Attic Black-Figure Hydria ca. 500 BCE attributed to the Leagros Group depicting Aias (Ajax) carrying the body of Achilles out of battle. Attic White-ground Lekythos ca. 490 BCE by the Diosphos Painter depicting Achilles dragging Hektor’s body behind his chariot. Notice also the winged ‘spirit’ of Patroklos flying alongside Achilles. Attic black-figured volute-krater, ca. 540–510 BCE, signed by the Nikosthenes Potter, depicting Zeus separating Athena and Ares while Kyknos on the far right is fleeing from Herakles approaching on his chariot (not visible in this view). Attic Red-Figure Skyphos, ca. 470 – 460 BCE depicting two young men performing acrobatic stunts at a symposium. Apulian Red-Figure Amphora by the Painter of the Berlin Dancing Girl ca. 430-410 BCE depicting Achilles and Briseis. Mycenaean rhyton in the shape of a bull’s head, ca. 1300–1200 BCE. Note the very straight horns, as described by Homer in Book 18, lines 573-588. Neck of a Proto-Attic Funerary Amphora ca. 650 BCE by the Polyphemus Painter depicting Odysseus and his men blinding Polyphemos the Cyclops. Detail of Attic Black-Figure Amphora ca. 530 and 520 BCE depicting a warrior mounting his chariot to depart for war. Lucanian Red-Figure Calyx-Krater, ca. 380 BCE by the Dolon Painter depicting Odysseus consulting Tiresias in Hades. Detail of Side B from an Attic black-figure amphora, ca. 530 BCE painted in the manner of the Lysippides Painter depicting a young warrior arming with the assistance of a woman. NEWSFLASH! Vail’s SHIELD OF ACHILLES Featured on Cover of New Oxford University Press Textbook!